The Wealth Gap : Should We Be Concerned? Last month international development organization Oxfam released a startling figure about the wealth gap between richest people in the world and the poorest half. According to the report, 85 of the wealthiest people in the world own as much wealth as the poorest half of the world. In other words, less than a hundred people have control over half of the world’s current wealth. The revelation has appalled many people and has refueled the tirade of criticisms being raised against capitalism and free enterprise. Nepalese media and intellectuals too have picked up the issue and resumed their criticisms against market. 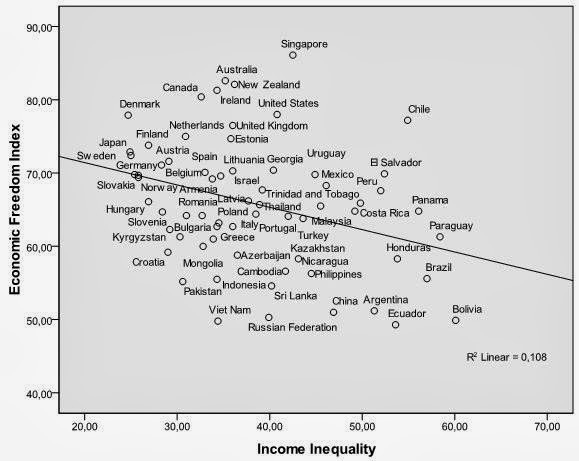 Income inequality is an issue Nepal should be concerned with too. It ranked 157th in the Human Development Index 2013 and the Gini Coefficient is 32.8 suggesting a significant income inequality. In this context, it is imperative to dwell on whether such income inequality is desirable for a society and what can be done about it. High levels of income inequality and concentration of wealth among a few people is certainly not desirable for a society. It can dampen the benefits of democracy and skew national policies making them favorable to the political and economic elites only which in turn will have negative effects on economic growth and development process and poverty alleviation measures. Income inequality has been found to correlate with violence and higher crime rates in a society too. However, it is essential to dwell on whether income inequality is a problem in itself or is it a symptom of underlying structural problems in the economy. Hence, the question is not just why 85 people own half of the world’s wealth but it is also why the poorest half of the world is producing and creating so little wealth when there seem to be immense possibilities for creating a wealthier world. It is interesting to note that majority of the poor in the world live in societies that are miles away from free market system and are supposedly pursuing policies aiming equality and wealth redistribution. India alone hosts one-third of the world’s poor and until 1990s, its major policy thrust had been wealth redistribution and state control of the economy. China which is another major home for world’s poor, started down the path of market economy only after disastrous 3 decades of anti-market and supposedly pro-poor policies. By moving towards market economy and promoting growth rather than redistribution, India has reduced its poverty rates from 51% in 1991 to 22% in 2013. China has achieved an ever more impressive progress by reducing poverty rates from 84% in 1981 to around 12% in 2013. What critics of market system have left out is the fact that the wealth distribution around the world was even more skewed before 1990s when many countries around the world started moving towards market economies. Empirical studies conducted in the context of developing countries have also found that economic freedom and income inequality have inverse relation suggesting that higher degree of economic freedom would result in lesser income inequality. For instance, a study titled “Economic Freedom and the trade-off between inequality and growth” conducted by economist Gerald W. Scully has found that economies with higher economic freedom not only enjoy higher growth rates than less free economies but they are also more equal. Economic freedom reduces inequality by increasing the share of market income going to the poor and lowering the share going to the rich. Economic Freedom of the World Index, a cross-country study on economic freedom conducted by Fraser Institute of Canada also shows that freerer societies are comparatively more equal than societies with lesser economic freedom. Therefore, gap between rich and poor either in terms of income or in terms of wealth stems from the fact that many of the societies that are home to the world’s poorest people do not have as much economic freedom as the richer societies. In this context, it is imperative that governments and civil society focus on spreading economic freedom to the poorer societies rather than using inequality as an excuse to push more populist and redistribution policies which will ultimately harm the poor even more despite having noble intentions. Another concern raised by the Oxfam’s revelation is the emergence of crony capitalism around the world including developed countries. Many of the people on the richest list are genuine entrepreneurs who have innovated new products, services and methods and created wealth but the list also contains people who have accumulated wealth through instruments of government and public policy. The unholy nexus between government and hug corporations has resulted in more wealth going to the crony capitalists rather than genuine entrepreneurs. Oxfam’s report depicts an increasing trend of wealth flowing to the top 1 percent in United States. The government’s act of bailing out huge banks and insurance companies after the financial crisis of 2008 must have contributed to the trend. This presents us with the lesson that, allowing governments the power to dole out favors and special privileges to certain group of people and businesses will ultimately result in concentration of wealth among the political and economic elites. As Nepal is gearing up for drafting a new constitution and we would definitely want a more equal and inclusive society, it is imperative that we limit the powers of government and restrict it from granting special privileges and favors to certain group of people or business regardless of how nobly such favors and privileges are packaged.